Five years ago, I publicly raised questions about Bowe Bergdahl's desertion from Blackfoot Company, 1-501 Infantry (Airborne), 4th Brigade Combat Team (Airborne), 25th Infantry Division. A few weeks after his so-called "capture" in late June 2009, three conflicting accounts surfaced: U.S. officials told the Associated Press Bergdahl had "walked off" the base with three Afghans; the Taliban claimed on its website that "a drunken American soldier had come out of his garrison" and into their arms; and Bergdahl claimed in his Taliban "hostage video" that he had "lagged behind a patrol" before being captured. I asked on my blog: Were the AP's sources mistaken? Or is the disturbing first account the right one? What about the "three Afghans" Pfc. Bergdahl reportedly "just walked off" with after his shift? Who are they? What's going on? Five years ago, one of the brave soldiers who risked his life to search for Bergdahl answered my questions, and I published his statement on July 20, 2009: "I know the story and the accounts that he was drunk or that he was lagging behind on patrol are not true -- this soldier planned this move for a long time. He walked off the post with a day's supply of water and had written down before that he wanted to live in the mountains. ... He is an embarrassment to everyone who has worn the uniform." "I was assigned to 1st Platoon of Blackfoot Company," based out of Forward Operating Base (FOB) Salerno in Khost, Afghanistan, he said. "Bowe's platoon was assigned to conduct security and stability operations out of FOB Sharana and other locations in Paktika. The untold background that led to Bowe's situation involves an article and pictures published by Guardian reporter Sean Smith." One of the battalion leaders punished soldiers, including Bergdahl (who had been photographed snoozing in his armored vehicle), with extra guard duty assignments for conducting operations in an unprofessional manner at Outpost MEST (OP MEST). "Bergdahl was already disenchanted with the war effort," my source said, "and I think the extra duty was the last straw for him." On the morning of June 30, 2009, "Bergdahl completed a guard shift, removed his equipment, weapon and sensitive items, and left OP MEST with several Afghan security forces personnel. He took a compass, a couple bottles of water and two knives and his journal. His exact intentions may never be known, but he willingly walked off OP MEST and was secured by enemy forces not long after." My source, who had been up the previous night on a separate raid, was "shaken awake" on the afternoon Bergdahl disappeared. "We were told there was a DUSTWUN (Duty Status Whereabouts Unknown), and to pack for a three-hour assault. We received a brief that Bergdahl was missing, and we were going to get him. ... Sometime after dark we boarded CH-47's to assault an objective thought to contain Bergdahl. We never made it to the landing zone, as the helicopters took very heavy fire on approach to the objective and had to divert." The soldier's Focused Targeting Force (FTF) platoon was not told that it was being diverted to OP MEST. When they landed, he said, "We thought we were in enemy territory, so I recall my friends and I screaming 'Vehicles' and preparing to engage with the LAW and SMAW-D rockets we carried. We soon realized the lights were from RG-31 and Maxpro MRAPs, friendly vehicles, and de-escalated the situation. The CH-47's had dropped us off at OP MEST and did not relay that information." With that near-disaster over, the soldier recounted: "We averaged 18 to 22 kilometers a day on foot, clearing house to house, room to room looking for Bergdahl. ... We even went as far as rappelling down wells and crawling through tunnels to look for him." The standard procedure for recapturing Bergdahl was not "normal," the soldier noted. "He was very good with knives, and trained to throw and fight hand-to-hand with knives. We did not know the mental state of Bergdahl at the time. All we knew was he left on his own, he caused us lots of hardship, and if we entered a room and saw him, we would put him down because he could attack us." 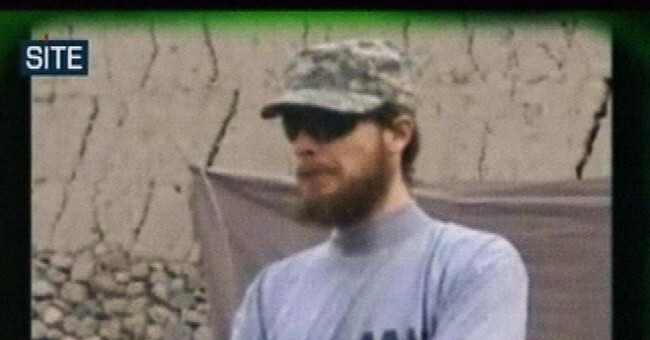 On the morning of July 4, 2009, the soldier recalled, "we assaulted several objectives looking for Bergdahl. ... We executed the mission without incident and were waiting to be exfiltrated. Our aircraft were in sight when they turned and flew in the opposite direction. At the time we did not know why, but we were stranded. The enemy took advantage of Bergdahl's capture and attacked numerous outposts that morning." My source continued: "We learned later that our exfiltration aircraft were diverted to support COP Zerok, and that the situation there was so dire that at one point there were two Apache gunships on station that went Winchester, meaning they expended all ordinance and ammunition, but they would not abandon the soldiers still fighting, so they resorted to low-level unarmed passes to distract the enemy. Bergdahl's actions undoubtedly caused these events. We spent the remainder of Independence Day walking in the desert ... waiting for aircraft that did not come for many, many hours." He continued: "A few days later, we (FTF) conducted a daylight raid on some tents looking for Bergdahl. We took heavy small arms and RPG fire on approach and ran off the CH-47s in contact. Our entire element engaged the enemy, who turned out to be a Taliban shadow governor and his bodyguards. ... Multiple people died that day. ... All of this happened because Bergdahl got tired of playing soldier. The remainder of that deployment was focused on recovery efforts. Countless members of the brigade were wounded, and we lost good friends, among them PFC Matthew Martinek and 2LT Darryn Andrews. I have no doubt these great men would be alive if Bergdahl did not leave." In addition to Andrews, Casillas, Fairbairn and Martinek, PFC Morriss Walker and Staff Sergeants Clayton Bowen, Kurt Curtiss and Michael Murphrey died as a result of Bergdahl's abandonment. That's eight dead American soldiers (not six, as the rest of the media have reported) betrayed by selfish Bergdahl and reckless President Obama. My source did not mince words: "The fact that our government negotiated with terrorists and our enemy is incomprehensible. The fact that they exchanged five war criminals for a traitor is sickening. The worst part for those of us that suffered through that time is that PFC Bergdahl is being hailed as some kind of hero. He was automatically promoted to Specialist and Sergeant, ranks he does not deserve and did not earn. I have no doubt he will receive back pay for these past five years, a substantial sum. There will be book deals, and his family are celebrities. I am glad he is safe, and happy for his family, but he should return home to face a court martial." Are you listening, Capitol Hill and America? The Bowe Bergdahl mess isn't just a story about one deserter, but two. There's the muddle-headed lowlife who left his post and brothers behind. And there's the corrupt commander in chief who has jeopardized more American soldiers' lives to "rescue" Bergdahl by bowing to the Taliban, while snubbing the surviving heroes and the eight dead American soldiers who lost their lives because of him. This cannot stand.